Service Provider of a wide range of services which include nec sl1000 epabx system. 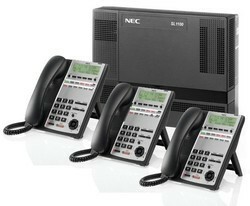 NEC SL1000 Fully Digital /ISDN/PRI/IP VOIP supported EPABX system. Extension and trunk inbuilt CLI supported. - External/Internal Music on Hold. - Expendable system up to 128 ports. - 02 port auto attendance inbuilt.